Published: Feb. 20, 2013 at 09:29 p.m. 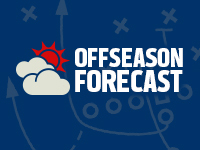 Updated: March 3, 2013 at 03:32 p.m.
With the offseason officially underway, Around the League will examine what's next for all 32 teams. The series continues with the Atlanta Falcons. It's steady as she goes under coach Mike Smith, whose 56-24 record over his first five years is second only to George Seifert's 62-18 in NFL history. While there's no change in on-field leadership, the Falcons will have to address their own key free agents while adding young talent on defense to take advantage of a Super Bowl window that might not be propped open for longer than another season or two. » TE Tony Gonzalez: Although Gonzalez was leaning heavily toward retirement during the NFL playoffs, signs are starting to point toward one last run at a Super Bowl title. The future Hall of Famer has already stated that he would only play for the Falcons if he does return for 2013. » SS William Moore: The Falcons are not expected to use their franchise tag this year. If that sentiment changes, Moore is the obvious candidate. He has hardly been the picture of health, but he's coming off a fine season in Mike Nolan's defense, and the safety tag is reasonable at $6.8 million. » LT Sam Baker: Baker bounced back from an injury-plagued 2011 season to regain his starting job and solidify quarterback Matt Ryan's blindside in 2012. Turning 28 in May, he should attract plenty of interest on the open market. » CB Brent Grimes: Assigned the franchise tag last offseason, Grimes played just one game before blowing out his Achilles tendon. He's a candidate for a one-year, "make good" contract to rebuild his value at age 30. 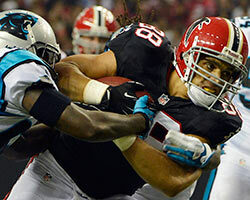 Take a look at the best photos from the Atlanta Falcons' 2012 season. It all starts with a defensive backbone. Quite simply the Falcons haven't been effective in stopping the run, particularly against mobile quarterbacks such as Cam Newton, Russell Wilson and Colin Kaepernick. The defensive line could use not only a designated run-stuffer, but also a talented young pass rusher to help fill the void left by John Abraham's release. The biggest offensive needs are re-signing Baker and finding a successor to the released Michael Turner as Jacquizz Rodgers' running back partner. At this point, it would be a surprise if Gonzalez doesn't return. The Falcons could target a power back early in the draft or turn to a free agent such as Shonn Greene. The secondary could be a priority with Moore slated to hit free agency and cornerback Dunta Robinson sent packing. Look for the defensive line to be addressed early in the draft. Entering a contract year, Ryan is a candidate for a lucrative contract extension after the Baltimore Ravens' Joe Flacco set the price in the quarterback market.